Volunteering is a great way to give back, "pay it forward," and make a lasting impact. Volunteering is also a great opportunity for individuals to enhance their communication, leadership, and organizational skills, and it provides opportunities for making friends, developing skills, and finding employment. 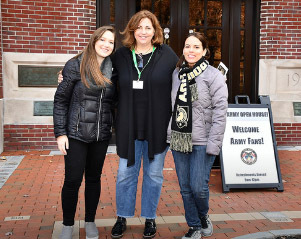 Volunteers are crucial components to globally growing the WPAOG and USMA brands, and their dedication and commitment are what help the West Point Association of Graduates remain the leading, most powerful, and most highly connected alumni body in the world. Those interested in becoming more engaged have several options available to support the Academy, WPAOG, and the Long Gray Line (see below). Society Leaders – Volunteers who run our local alumni chapters all over the world. Class Leaders – Volunteers who do administration for their Classes, as well as Scribes/Historians who gather and submit Class Notes and those who help coordinate Memorial Articles. SIG Leaders – Volunteers with a shared affinity who want to connect with other graduates with the same interest and want to give back to Cadets also sharing in that interest. Parent Club Leaders- Volunteers who have or had children as cadets and who want to support the Corps. WPAOG Volunteers – Volunteers who help out at WPAOG events such as open houses, graduation, and tailgates. TAPS Volunteers – Volunteers who write TAPS articles. Class Giving Volunteers – Volunteers who help fundraise as part of the Gift Selection or Fundraising Committees. Advisory Council – Elected volunteers who represent the Societies, Classes, SIGs, and graduates-at-large at WPAOG Board meetings and on conference calls, voting on pertinent matters. Board Members – Elected volunteers who oversee the administration of the West Point Association of Graduates. Career Industry Advisors – Volunteers who assist graduates with career transitions. Reunion Chairs – Volunteers who help plan and execute their Class’s reunion.